We estimate that for 2016, retail, mail, specialty, and long-term care pharmacies dispensed about $115 billion in specialty pharmaceuticals. (See Our Exclusive 2021 Outlook for Specialty Pharmacy Prescription Revenues.) How many specialty pharmacies are operating in the market? What types of organizations own these pharmacies? 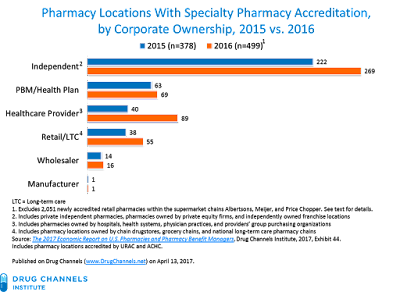 Pharmacy locations owned by healthcare providers—such as hospitals, health systems, physician practices, and providers’ group purchasing organizations—were the fastest-growing category of accredited specialty pharmacies. Bottom line: A growing number and diversity of pharmacies are battling for control of the specialty market. Pharmacies owned by PBMs, wholesalers, insurers, retailers, and providers can now prove that they are special. Manufacturers and payers will need to figure out how to handle this increased competition and the associated demands for new network designs. This post is adapted from Sections 3.1.3., 3.2.1., and 3.3.1. of our 2017 Economic Report on U.S. Pharmacies and Pharmacy Benefit Managers. There is no universal definition of a specialty pharmacy. A pharmacy can designate itself a “specialty pharmacy” if its business focus is self-administered specialty pharmaceuticals covered under a patient’s pharmacy insurance benefit. 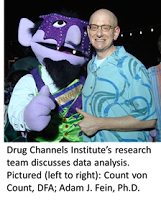 That's why even Count von Count has trouble counting the total number of pharmacies that dispense specialty drugs. However, the majority of specialty drugs that pharmacies dispense to patients are sold via self-defined specialty pharmacies. Given this self-designation, independent accreditation organizations can help a pharmacy develop and verify its capabilities to manufacturers and third-party payers. Our analyses are based on data that we independently gathered from the two largest accreditation organizations (URAC and ACHC). At the time of our analysis, all CPPA locations were accredited by one or both of the other organizations. ONE SPECIALTY PHARMACY, TWO SPECIALTY PHARMACIES…AH AH AH AH AH! We identified more than 2,500 unique pharmacy locations that had achieved specialty pharmacy accreditation as of early January 2017. However, this year’s ACHC data included more than 2,000 newly accredited locations from retail pharmacies within the supermarket chains Albertsons, Meijer, and Price Chopper. None of these locations was also accredited by URAC. See Section 3.2.1. of our 2017 pharmacy and PBM report for more details on these locations. Excluding these supermarket locations, we identified 499 unique pharmacy locations, a 32% increase over the 378 locations identified in our previous analyses. 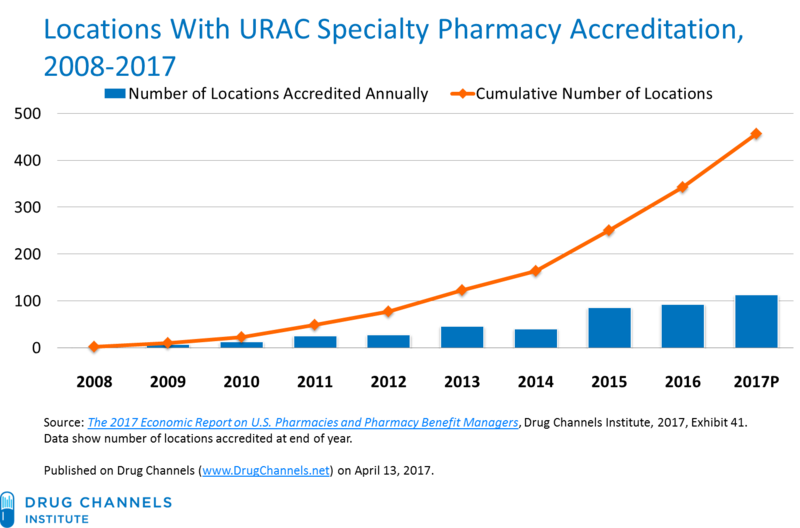 For the 499 locations with specialty pharmacy accreditation: 206 were accredited only by URAC, 161 were accredited only by ACHC, and 132 locations were accredited by both URAC and ACHC. 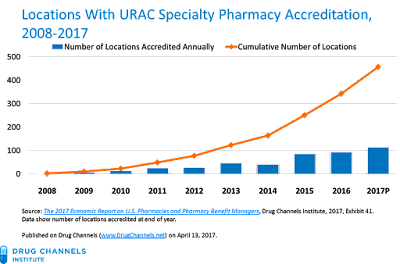 Given the changes in the ACHC data, a consistent proxy for growth in self-designated specialty pharmacies comes from the number of locations with URAC’s Specialty Pharmacy Accreditation. The chart below shows the locations accredited each year along with cumulative accreditations. By the end of 2016, more than 340 specialty pharmacy locations had achieved Full Accreditation from URAC. We project that this growth will continue, with total URAC accreditations exceeding 400 locations by the end of 2017. Pharmacy locations owned by healthcare providers—such as hospitals, health systems, physician practices, and providers’ group purchasing organizations—were the fastest-growing category. Providers now account for one in five accredited specialty pharmacy locations. The location data do not correspond with the market share of specialty prescriptions or specialty dispensing revenues. Despite the prevalence of independent pharmacies with specialty accreditation, central-fill mail pharmacies dominate dispensing activities. This dominance is due partly to network strategies that require patients to use the specialty pharmacy that the plan or PBM owns and operates. Smaller specialty pharmacies, physician offices, and health systems often struggle to access specialty medications within these networks. Consequently, the two largest PBMs—Express Scripts and CVS Health—remain the largest participants in the specialty pharmacy market. See The Top 15 Specialty Pharmacies of 2016. Not everything that counts can be counted, and not everything that can be counted counts. But as our obsessive enumeration shows, the specialty boom is reshaping pharmacy market competition. P.S. If you’ll be attending Asembia’s Specialty Pharmacy Summit, be sure to join me on May 1 for the opening Featured Session in the Encore ballroom. I’ll be updating everyone on the state of the specialty pharmacy market. More details on Monday.